The field from one of the biggest college sporting tournaments in the world has been narrowed down to 16 teams, representing regions from across the country. While fans continue to look for fun ways to entertain their guests at home and keep them fueled during all the action, the makers of HORMEL® Chili wanted to provide fans from each region a way to celebrate. 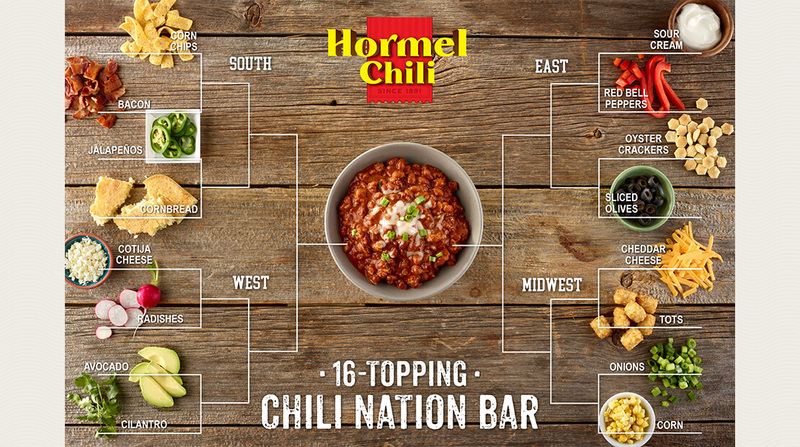 Introducing the 16-Topping Chili Nation Bar – paying homage to one of the most-watched portions of the big tournament; this chili bar is sure to please fans from all over the country with specific ingredients tied to each region.